Bischoff’s Gallery opened in 1999 by Arizona native Anselm Bischoff. 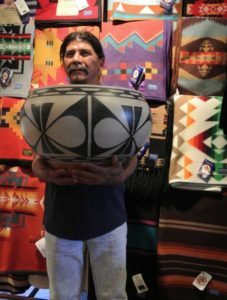 Anslem Bischoff’s passion for fine arts and crafts developed from watching his grandfather, Camillo Garcia, who collected and traded with the Native Americans at his trading post in Canyon de Chelly. Bischoff’s Shades of the West (founded in 1971) and Bischoff’s Gallery located in Old Town, Scottsdale, Arizona offer a wide spectrum of both contemporary and traditional art. 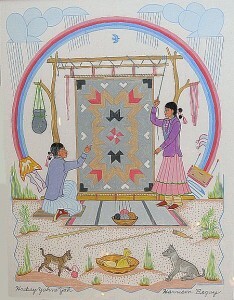 The gallery carries work by Native American, western, and southwestern artists. 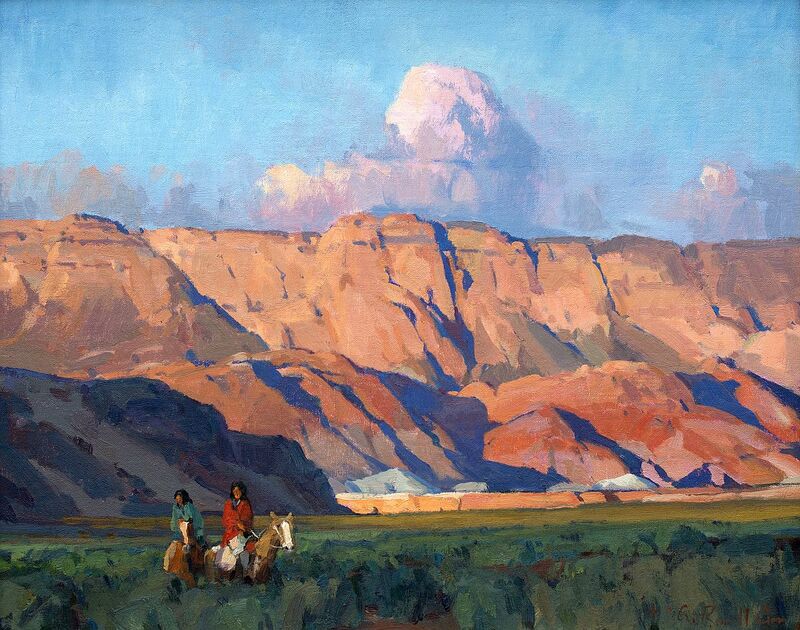 In 2014 Bischoff’s proudly welcomed Utah born american landscape painter G. Russell Case. Known for it’s collection of fine Native American Jewelry, Bischoff’s also offers a selection of Navajo rugs, Hopi kachinas, pottery, baskets and fine art from artisans of many tribes. Be sure to visit the gallery on your next visit to Scottsdale. We are located in scenic historic Old Town Scottsdale at the intersection of Main Street and Brown Avenue (east of Scottsdale Road). Pueblo potter Ambrose Atencio joined us in November with 5 more of his largest pots. He may reappear here at the gallery during the Heard Museum Market, Saturday March 4th. “Pueblo pottery is made using a technique that came to Northern Arizona and New Mexico from the south, some 1500 years ago. In the four corners region if the U.S. 19 pueblos and villages produce pottery.” Museum of Northern Arizona Santo Domingo pottery reflects an adherence to ancient traditions. This pottery reflects the conservative pueblo values displayed by the traditional geometric patterns as well as the classical birds, flowers, raindrops and sun patterns. This pottery was made primarily for home use so the form reflects function. Santo Domingo potters are well known for making some of the largest ollas and dough bowls. These hand coiled, traditionally painted pots are fired outdoors. Ambrose Atencio is a well-respected potter and his are some of the largest pieces you will see. 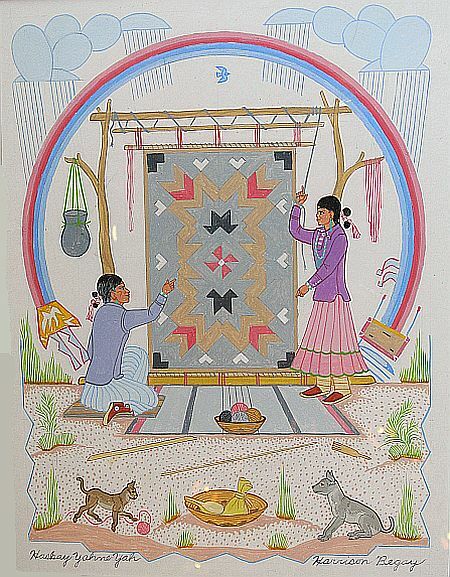 Chester Poleyestewa is a Hopi Artist who carves only in the traditional style, a style that is more similar to that of kachinas of the early 1800’s: arms tucked close to the body and well thought out adornment. 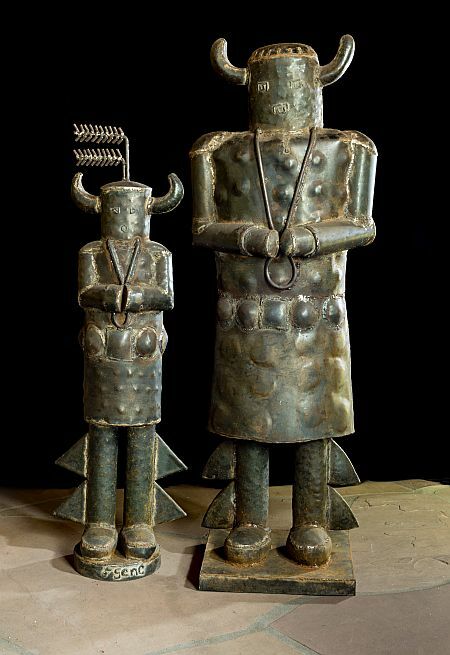 This differs from the intricately carved kachinas that are heavily carved with exaggerated motion. 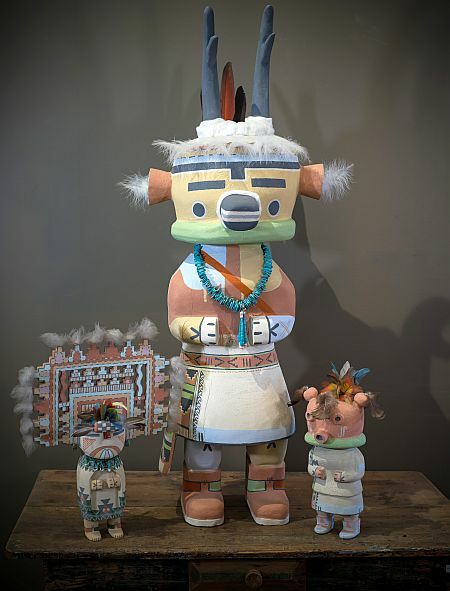 Kachina dolls were and are made by Hopi uncles and fathers for their daughters and nieces so they would learn to recognize the dancers’ masks during ceremonies, and the lore behind them. Chester’s dolls range from $350 to $7,500. 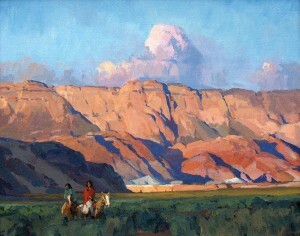 G. Russell Case’s work is fresh, pure and simple, but still containing the beauty, and the power of the American West. The vast landscapes, a lone cowboy or a simple hogan portray the timelessness of nature and the insignificance of man. In the style reminiscent of Maynard Dixon or Edgar Payne, the highlights, planes and shadows depict the absolute majesty of the west. Bischoff’s Gallery represents Russell Case on an on-going basis but this annual exhibition gives collectors the opportunity to add one of the new pieces to their collections and a beginning collector the opportunity to meet Mr Case. Bischoff’s Gallery has a focus on the paintings done of Canyon de Chelly, Vermillion Cliffs and the geographic region of the four corners area of the southwest. The range of sizes and prices are from 8 x 10 $2,000 to 30 x 50 $38,000. We have additional new pieces. For well over 100 years, artists have been drawn to the red rocks of the Four Corners region in the American Southwest. Works by two of the most famous to paint the area, Maynard Dixon and Edgar Payne, will set the tone for enjoying the art of current masters Russell Case, Denise Mahlke, Ray Roberts and Matt Smith. Mud, smoke, dust, stars and sand…These are the elements that shape the lives of the Dineh (Navajo). 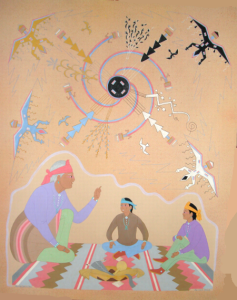 Both Jack and Frank Gene are artists who derive inspiration directly from the soul of their Dineh (Navajo) culture. Jack’s images are colorful, compelling and intimate visions of a land and people long hidden from the outside world. Frank was influenced by the Hopi Kachina carvers and had worked in wood but now prefers working in steel. both his earlier wood pieces as well as the steel pieces will be available for purchase. For decades now, the Bischoff Gallery has been captivated by and has collected more than 200 paintings by Navajo artist Harrison Begay (1917- 2012). Born in White Cone, Arizona, Begay came from humble beginnings gained renown for his devotion to his art. As a boy he herded his family’s flock of sheep. In 1933, his passion for art drew him to Santa Fe Indian School. He studied under Dorothy Dunn in her Studio School. He studied with quite the class. During his time there, his classmates included Andy Tsinijinnie, Gerald Nailor, Alan Houser, Pop Chalee and Quincy Tahoma. Under the direction of Dunn, he learned the classic “Studio Style” or “flat-style painting.” He was the last living former student of Dorothy Dunn at the Santa Fe Indian School. Harrison painted what he knew the best – scenes from traditional Navajo life on the reservation. 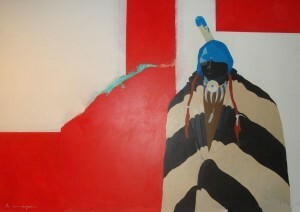 He was best known for painting the Navajo people in ceremonial and daily life and horses with riders. He was named a “Living Legend” in 1990. His work is in the permanent collections of many museums including the Smithsonian, Philbrook, Gilcrease and Museum of Western Art. At the age of 94, Harrison Begay died August 18, 2012 in Gilbert, Arizona. He is buried in the Fort Defiance Veterans Cemetery. 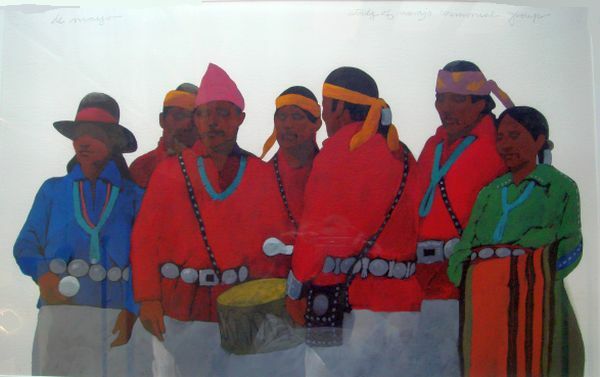 Bischoff’s Gallery is pleased to present a broad selection of the opaque watercolors by HARRISON BEGAY. 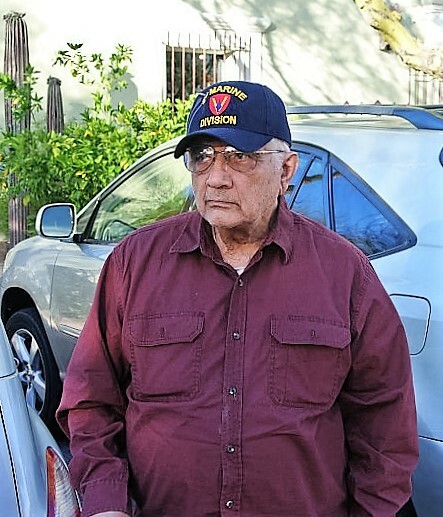 Louis Anthony DeMayo, 90, passed away on March 11, 2016 in Surprise, Arizona. He was born in Philadelphia, Pa. in 1926, a first generation Italian-American. After serving in the Marines for three years and being one of the first American troops to set foot in Japan during World War II, DeMayo attended the Pennsylvania Academy of Fine Arts and the Hussian School of Art. He had his first exhibition in 1952. DeMayo’s early works have been exhibited at the Philadelphia Museum of Art, Temple University, Detroit Institute of Art, Moore College, and the Philadelphia Civic Center as well as being displayed in some of New York’s finer galleries. DeMayo moved to Phoenix, Arizona in 1971 to take the post of Art Director for Arizona Highways Magazine. He very quickly discovered a fascination and ardent appeal for Arizona’s Native American tribes and left Arizona Highways to concentrate on his career as an artist. Over time DeMayo’s work evolved, and soon he became recognized for his style of contemporary southwest art. 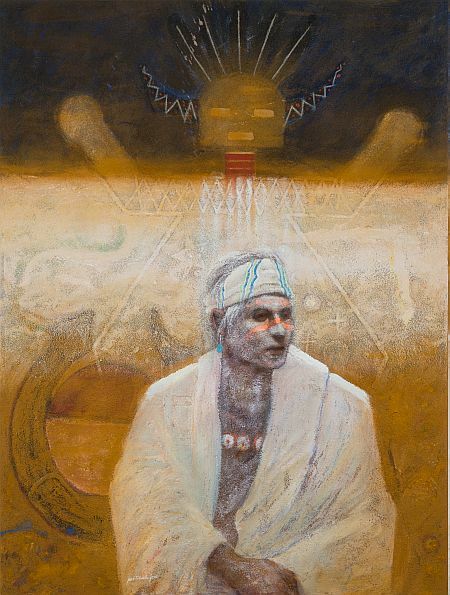 During his long and lauded career DeMayo has painted hundreds of Native American images, and his work has been acquired by a breadth of art lovers and private collectors across Arizona, the United States, and as far reaching as China and Germany. DeMayo made a segue to abstract art around 2002 and in 2011, DeMayo was awarded the prestigious Pollack-Krasner Foundation Grant. He continued painting into his 90th year. His works have appeared in such varied publications as Time magazine, Advertising Age, Today magazine, Fortune magazine, and Arizona Highways. DeMayo has been considered a trailblazer in the area of contemporary southwestern art. Bischoff’s Gallery is pleased to be able to offer a wide range of sizes and prices of works in the collection that are available for purchase. Sizes and prices range from 8 x 10 $1,200 to 48 x 60 $20,000.